I have a confession to make. I don't get enough sleep. On average, I get about 6 hours of sleep a night ... nowhere near enough to be considered beauty rest. The result? I'm left with unsightly bags and dark circles that frequently make me look as though I got in a fistfight with a burly man at a bar. That is, until Benefit Depuffing Action Eye Gel came along. 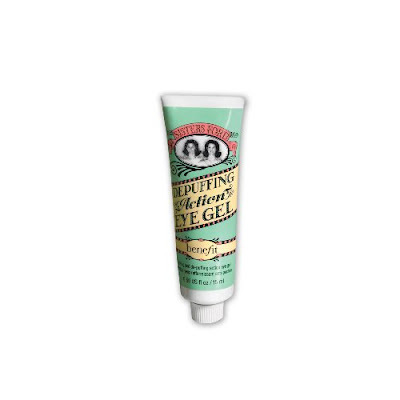 This unassuming little tube is chock full of stimulating plant fibers, chamomile and raspberry extracts that work to ... you guessed it ... depuff! Just a tiny dab -- we're talking pinprick-sized -- and you'll be amazed at how quickly your visage transforms. It sinks in immediately with no greasy residue. Not to mention it's cooling, soothing and unbelievably hydrating. I've taken to applying post-shower and watching the magic happen virtually instantly. ooo... this sounds like it feels nice! ;) it sounds great for depuffing but how did it work for the dark circles? THAT i am always on the hunt for... haven't found anything that's made a significant difference yet. This sounds too good to be true? And for less than $30 to boot! I'm always on the search for eye creams that depuff and erase these black holes.